Netgear has been announcing new members in their Wi-Fi 6 802.11ax router family regularly over the last few months. We discussed the launch of the RAX80 and RAX120 in detail last November. Since then, Netgear has also introduced a tri-radio solution, the RAX200. The RAX80, RAX120, and RAX200 currently have MSRPs of $400, $500, and $0 respectively. These price points have made it challenging from a market adoption encouragement perspective. Netgear is aiming to address this issue with a new Nighthawk RAX40 AX3000 router. 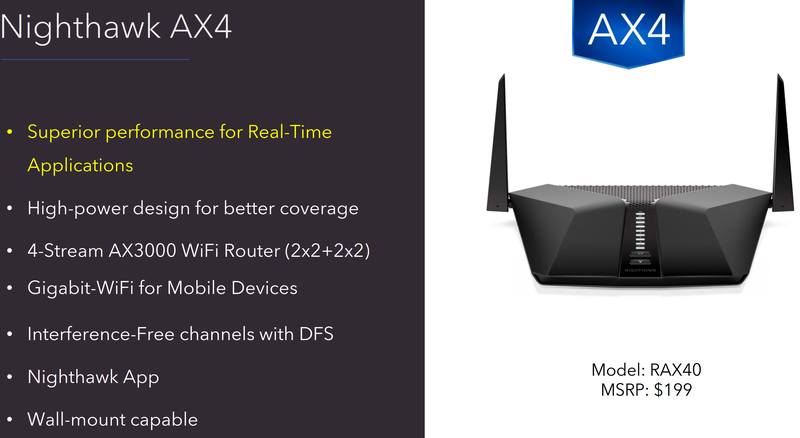 This AX4 model has a 4-stream configuration. Its $0 MSRP is significantly lower than the price points at which the other Nighthawk Wi-Fi 6 routers are being sold. While the previous Nighthawk Wi-Fi 6 routers were based on either Broadcom or Qualcomm silicon, the RAX40 is based on Intel's Moore Rapids platform (Intel Home Wi-Fi Chipset WAV600 series). The table below summarizes the specifications of the four Wi-Fi 6 routers currently in the Netgear Nighthawk family. The Nighthawk RAX40 is a good entry point into the Wi-Fi 6 ecosystem for the average consumer. With almost all 802.11ax client platforms using a 2×2 configuration at the maximum, single client scenarios will see barely any difference in terms of performance with the RAX40 and any of its higher-priced siblings. Things will obviously change when multiple wireless clients come into play simultaneously. The RAX120, for example, can support four simultaneous 2×2 MU-MIMO clients with its 8×8 5GHz configuration. That said, the RAX40 supports DFS and 0 MHz channels – two aspects that can show the bandwidth benefits immediately to the end users. In fact, the RAX40 can deliver gigabit wireless to even 802.11ac clients such as the Intel Wireless AC9560 present in the Bean Canyon NUCs. Overall, the introduction of the RAX40, particularly in conjunction with the availability of Cyclone Peak-equipped computing systems starting this quarter, is a big boost for the Wi-Fi 6 ecosystem. The Wi-Fi router space has been dominated by Broadcom and Qualcomm (and, Mediatek to a smaller extent) for quite some time now. The addition of Intel as a serious player in this space is welcome news for consumers.